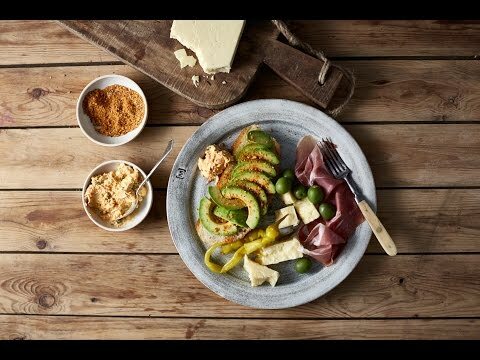 A unique gathering of flavour and texture – our recipe for cheddar with avocado, dukkah, focaccia and sivri pepper blends soft nuances from smooth avocado and sharp Cheddar alongside gentle heat curtesy of pickled Turkish peppers and dukkah. Calmed though not tamed, the result is tingling with a soothing finish. Remove the cheese from the fridge half an hour before serving. Break the Castello Tickler Mature Cheddar cheese into suitable portions. Slice the avocados and arrange the slices on the bread. Place the bread on four plates and sprinkle with dukkah. Distribute the sivri peppers, olives, haydari and slices of prosciutto on the plates. Serve with lemon wedges.